Generations of fly fishers have relished the area above the Jet Propulsion Laboratory in Pasadena, which before the massive 2009 Station Fire and subsequent flood the following year, enjoyed a reputation as an enjoyable fishery. This reputation, for now at least, has certainly faded. On top of back-to-back environmental disasters, we’re in this ongoing drought. But remember, these skinny waters still contain native trout, and this region was once one of the coveted destinations for returning spawning Southern California Steelhead. The area is important to protect, even though, for some mysterious reason, it was left out of the final draft of the San Gabriel Mountains national monument. That will be the topic of another blog post. So today’s question: Do we need a human-made disaster on top of all of this? The City Council this week unanimously approved a set of recommendations for the county’s sediment removal plan in Devil’s Gate Dam, in its ongoing fight to prevent the treasured Hahamongna recreation area from turning into a giant ditch. For example, the original county plan counted 400-plus trucks per work day, for five years, to haul away sediment, while the Pasadena plan calls for a quarter of that amount, an estimated 120. The county’s plan for habitat impact — a euphemism for “no more fishing” — measures more than 120 acres, while the Pasadena plan calls for 40 acres, including a 10-acre “conservation pool.” From what I read here, the county has somewhat backed off on its original proposal, but not nearly to the degree concerned homeowners want. The final Environmental Impact Report comes before the Los Angeles County Board of Supervisors on Wednesday, as the flood control district seeks approval for its chosen alternative. According to this story La Canada city officials are scrambling to get their objections heard before it’s too late. Thanks for highlighting the San Gabriel, Jim, and raising awareness of wild fish in the watershed. Seems like the political winds are shifting to our back and it would be nice to get a win for the fish! It is my understanding that the SG O. Mykiss thing is of less interest if the chances of access to the ocean are next to nil regardless of genetics (which is, to me, the sad part). Thanks for keeping us to date! I fondly remember hiking and fishing that area 25 years ago. 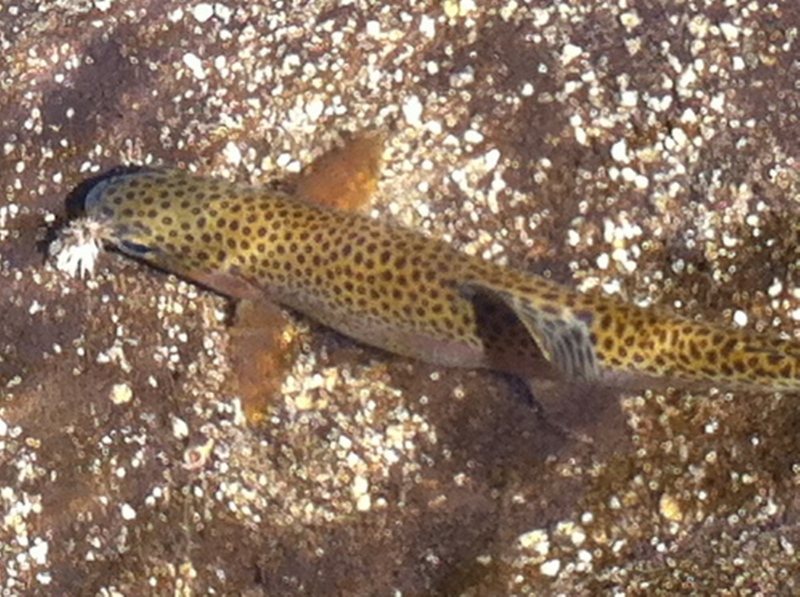 There were plenty of trout, even wild born ones in the upper reaches.